Panasonic's Varicam LT with Panasonic's OLED EVF, Interchangeable PL Mount, Cinema-Style Shoulder Mount, Grip Module, 256GB expressP2 media card, and a P2 media card reader. This creates an camera package that is ergonomically balanced, requiring only batteries and a lens to go shoot. The camera itself features a Super 35-sized sensor with two distinct native ISO ratings. This kit includes an interchangeable PL mount that enables you to swap out the EF mount that ships with the camera, so you can use PL mounted lenses. The 256GB expressP2 card can capture footage at the camera's highest data rate, while the USB 3.0 media card reader is backwards compatible with USB 2.0. Designed to work with the Varicam LT, the OLED viewfinder features a variety of advanced function, menu and navigation buttons as well as an indexed diopter adjustment range. All the hardware required to mount it to your camera is included with the EVF. The shoulder mount features a padded shoulder cavity and is compatible with VCT-14 tripod plates. It incorporates front and rear mounted 15mm rod clamps, and the ARRI-compatible rosettes are replaceable. The Grip Module is a contoured handgrip with integrated start/stop trigger. The grip can be adjusted for your comfort and attaches to an ARRI-compatible rosette. The VariCam LT is equipped with the Super 35mm, single-chip MOS that offers 4K (4096 x 2160) and UHD (3840 x 2160) resolution. It boasts high sensitivity, low noise, and wide dynamic range. The sensor's size delivers the classic cinematic depth of field as it is the same size as the film frame in motion picture cameras. The camera features a dynamic range of 14+ stops when shooting in Panasonic's BV-Log, which enables accurate image rendering over the entire image, from dark areas to highlights. Even in very dimly lit scenes, the VariCam LT provides low-noise images without any compromise in picture quality. 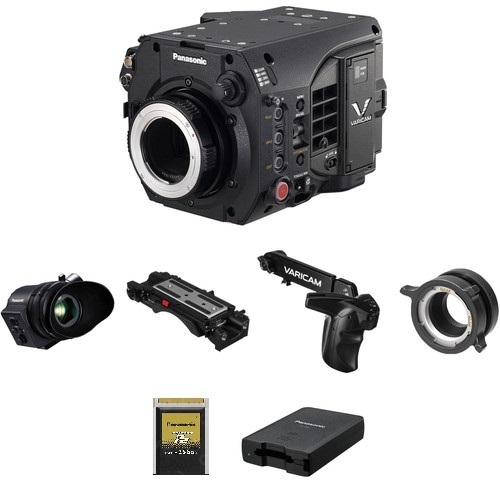 The VariCam LT is equipped with V-Gamut, which encompasses the entire BT.2020 color space. The VariCam-LOOK (V-LOOK) mode is a setting for creating cinematic images without color grading. Featuring a gamma curve that allows detail to be maintained over a greater tonal range within the Rec 709 color space that has also been included in the VariCam LT. The V-709 gamma setting provides a tone suitable for viewing on standard monitors while the BC-LOOK creates a look that mimics traditional TV broadcast images. The VariCam LT provides down conversion to Full HD via two 3G HDSDI outputs and one VF output (BNC) while shooting in 4K.Your look with in-camera color grading and information overlay can be applied to each output. The maximum frame rate when recording in 4K (4096 x 2160) or UHD (3840x2160) resolution is 60p (60 fps). When shooting in 2K (2048 x 1080) and HD (1920x1080) resolution, high-speed 240 fps recording can be used to produce an extreme slow-motion effect. Variable frame rates are available from 1 to 120 fps in AVC-Intra 2K422 and from 120 to 240 fps in AVC-Intra 2K-LT. The frame rate is variable in-shot while recording. Using the 256 GByte expressP2 card, the camera can record approximately 90 minutes of 23.98p 4K video with AVC-Intra 4K422. The camera can simultaneously record proxy-quality footage to an SD card. The VariCam LT features an in-camera color grading function (3D LUT/CDL). This enables color tuning on set as well as in the field when using the camera control panel or 3rd party software. Grading information such as 3D LUT files and CDL files can be recorded simultaneously with the image data, providing a simple way of protecting your vision from overly aggressive editorial tweaking. A key accessory for the VariCam LT, the Cinema-Style Shoulder Mount from Panasonic not only serves as a shoulder support for the camera, but also as a 15mm LWS rod baseplate for building up your rig. The camera interfaces with the Shoulder Mount via an included ARRI standard sliding quick release plate for easy attachment and removal on set, while the shoulder support itself complies with the VCT-14 standard, allowing you to mount the entire rig to compatible tripod plates. For accessory mounting and support, the Shoulder Mount features front and rear 15mm rod clamps, with ARRI standard rosettes near the front rod clamps to support an optional Grip Module or other third-party hand grips. In addition to the VCT interface, the V-wedge has a 3/8"-16 threaded hole for mounting your rig to other tripod and dovetail plates. The 256GB B Series expressP2 Memory Card from Panasonic supports the high-quality, high-frame-rate recording of 4K/120 fps and HD/240 fps. The card features 10 Gbps data transfer speeds, capable of recording 4K footage and high-frame-rate VFR images up to 240 fps in HD without sacrificing the durability you've come to expect from P2 media cards. The expressP2 card features an individual serial number for media tracking, an internal raid configuration, and error correction functionality to protect your footage from data loss. The solid state construction provides the media with shock, vibration, and temperature resistance and the well-established PCMCIA connector used by the P2 system has a proven track record of 30,000 insertion / removal cycles for reliability. Among the variety of optional accessories Panasonic has released for the VariCam LT is a robust PL Mount Adapter. The camera's EF mount can easily be switched out for this adapter, and the flange distance remains the same. The Grip Module for VariCam LT is a right-sided handgrip and extension arm for shoulder-mounted operation of the VariCam LT digital cinema camera. It attaches to the VariCam's optional cinema-style or ENG-style shoulder mounts, but will also attach to any shoulder rig or rod support system that features an ARRI standard rosette. The Grip Module includes an ergonomic handgrip and a telescopic arm that extends from approximately 8.3 to 10.4". The handgrip features a REC start/stop button, iris control dial, and two user-assignable buttons for quick access to frequently used camera functions. Integrated into the grip is an 11" coiled control cable with a 12-pin Hirose connector to interface with the camera. Box Dimensions (LxWxH) 15.0 x 14.5 x 11.5"
Box Dimensions (LxWxH) 14.0 x 7.5 x 4.5"
Box Dimensions (LxWxH) 13.9 x 8.1 x 8.0"
Box Dimensions (LxWxH) 7.1 x 7.0 x 5.8"
Box Dimensions (LxWxH) 4.6 x 3.4 x 1.4"
Box Dimensions (LxWxH) 10.2 x 7.4 x 6.5"